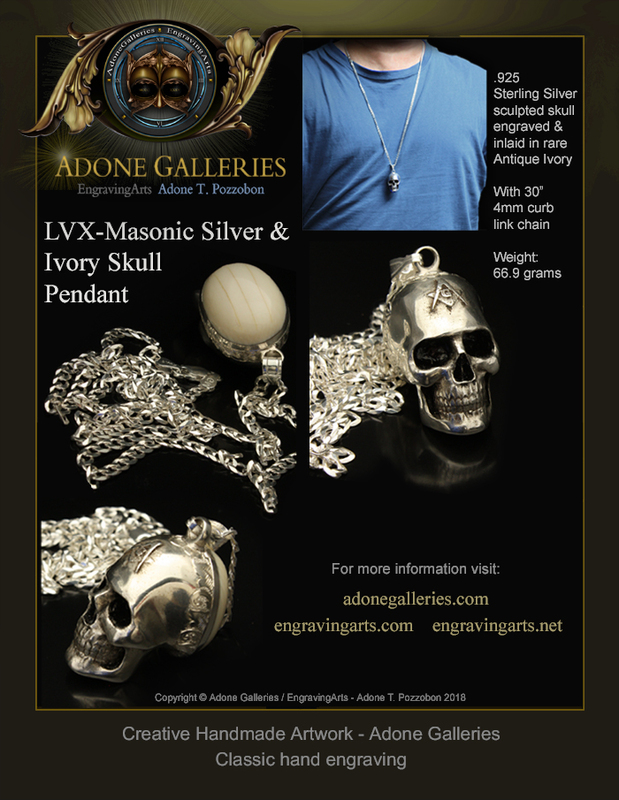 The LVX-Masonic Skull Pendant beautifully made in .925 Sterling Silver and inlaid in Antique Ivory revists the bygone era when finely hand crafted gentleman's jewelry expressed a unique flare. The LVX-Masonic-Skull is stylishly sophisticated in design, and its Antique Ivory inlay is particularly rare because of its three stripes that through symbolism carry deeper significance to the Master Mason. The .925 Sterling Silver 4mm curb link chain compliments the Masonic Skull Pendant and together sport a handsome 66.9 gram weight. The beautifully sculpted skull is lightly accented with a hand engraved decorative border and engraved with .925 and artist signed. Addionally, Pocketwatch enthusiasts can easily convert this Skull pendant into an elegant Watch Fob by easily swapping out the current chain with an Albert Chain making this Masonic Skull Pendant perfect for any gentleman. Fine classic handmade jewelry, hand engraved luxury Masonic rings, silver pendants Masonic Momento Mori Skull. Sterling silver Freemason skull with hand engraving inlaid in antique ivory. Haute signet rings and Sculpted Skull Art, skull doubles as Pocketwatch Fob.